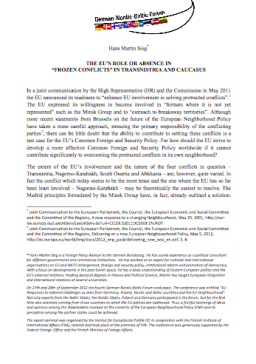 In a joint communication by the High Representative (HR) and the Commission in May 2011 the EU announced its readiness to “enhance EU involvement in solving protracted conflicts”.1 The EU expressed its willingness to become involved in “formats where it is not yet represented” such as the Minsk Group and to “outreach to breakaway territories”. Although more recent statements from Brussels on the future of the European Neighborhood Policy have taken a more careful approach, stressing the primary responsibility of the conflicting parties2, there can be little doubt that the ability to contribute to settling these conflicts is a test case for the EU’s Common Foreign and Security Policy. For how should the EU strive to develop a more effective Common Foreign and Security Policy worldwide if it cannot contribute significantly to overcoming the protracted conflicts in its own neighborhood?